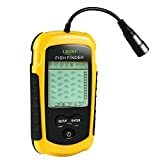 Finding that affordable fish finder that does everything you want is quite difficult, but there are resources out there including this review. Electronics including fishing equipment can become costly, but there’s no denying the value they bring to make your next fishing trip one of the best. These essentials to fishing takes the entire sport to the next level which have become a necessary component to professionals and enthusiasts alike. Affordable fish finders and depth finders give you what you need including locating fish and scoping out the underwater terrain to determine the best locations. While looking at the best options, we’ve considered everything a savvy consumer and angler want to know including performance, ease of use, features, and of course, the price. This review takes an in-depth look at the Top 5 Cheap Fish Finders Under $100 in 2017 – 2018 making your decision much easier. This Artmark portable fish finder is a new 2017 model and is a clear upgrade from the former model. 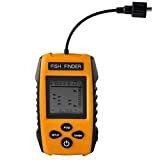 This portable fish finder and depth finder combo complete with a sonar sensor transducer which is wired which allows you to locate fish anywhere from 0.6 meters to 100 meters underwater. Outfitted with an LCD display which is wider and clearer than the previous model and works in any lighting conditions. Coming in well under $100, this Artmark fish finder scores a 9.1 out of 10 and comes with all-positive consumer reviews. This best-seller gets high regards with its detection system which locates grass, weeks, and rocks while displaying the location of fish and depth of water. Other features include 7.5-meter cable, water temp indicator, water resistant design, and can even displays the size of the fish. Lowrance introduced a budget friendly fish finder that’s not only portable, but boasts the performance of much larger models. 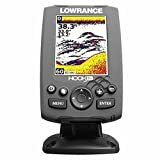 The Hook-3X Sonar fish finder features a bright 3-inch backlit color display which clearly displays underwater structures, terrain and fish. The display has a resolution of 320 x 240 which offers pretty good visuals for a fish finder under $100. The Lowrance Hook-3X offer optimum viewing angles and illuminates well even under direct sunlight conditions. Some of the biggest features include a ASP, or advanced signaling system which minimizes the need to make manual adjustments to the settings, dual frequency operation, and a 83kHz sonar operation which offers a better search radius than other fish finders in this price range. One of the top-selling fish finders under $100 of all-time is this portable model from Venterior. This fish finder features a wired sonar sensor transducer along with a 25-foot cable. Giving you a depth range from 1-meter to 100-meters, you can visually see fish and other underwater elements right on the LCD display. Simple to use in any fishing environment including lakes, rivers, streams, and oceans making a versatile, necessary piece of fishing equipment. The Venterior features a wide range of settings including battery saver mode, backlit, unit of measure, sensitivity and allows you to toggle the water depth in feet and meters. The receiver is waterproof, but the only downfall is the screen is not which is something to consider if you’re intending on picking it up. OUTAD introduced a quality fish finder under $100 that scores an 8.1 out of 10. This sonar fish finder is highly portable and is a handheld model that detects fish and underwater elements such as weeds, rocks and sand. The customization options allow the user to adjust the sensitivity settings to get the most out of fishing in any condition. The portable OUTAD sonar fish finder features a fish alarm which detects fish when they’re within range of the sonar, backlit mode, battery saver mode, unit of measure, and displays the depth in meters or feet. The ergonomic design allows you to take it with you and features an attached rope which allows you to wear it around your neck. If you’re looking for a larger fish finder with a clear colorful display, this Generic model does just that. The Generic FF118A is a pro grade model which is highlighted by a larger 4.3-inch display which features Sun Vison for Bright Environment Outside technology which works well in any lighting condition. 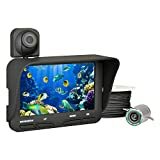 It also features an underwater IR 0.3MP camera with a 140-degree wide angle view. The Generic FF118A fish finder comes complete with a 30-meter extension cord and can be attached to a pole or mounted directly on the ground. Out of the box, you get the fish finder with a 4.3-inch color display, 2 Li-Ion batteries, charger, mounting bracket, pole accessory, and owner’s manual. Not bad considering this Generic fish finder comes in just below $100 which is a steal at this price. 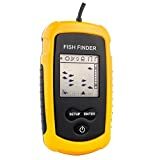 Feel free to share in on the conversation and drop your opinion regarding this review of cheap fish finders in the comment section below.